The last of a group of 20 Syrian Christians kidnapped Oct. 5 have been released as their pastor awaits trial before an Islamic court. Rev. Hanna Jallouf, a Franciscan priest in the northeastern Syria town of Knayeh, was abducted with about 20 other Christians late Oct. 5. The town, in Idlib province, is 8 kilometers from the Turkish border, an area where Al-Nusra Front and other rebel groups have been fighting the Syrian army for three years. 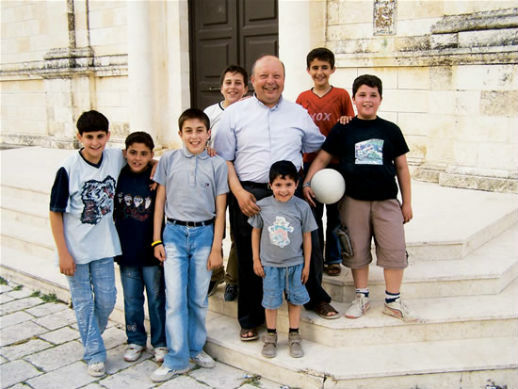 Citing Franciscan administrators in the region as well as “local sources,” the Vatican news agency Fides reported Oct. 7 that Jallouf and “several men of the Christian village” had been abducted. On Oct. 9, Fides reported that four women had been released the previous day. On Oct. 10, it reported that, of the remaining 16 hostages, all but five men had been released by Oct. 9. Finally, on Oct. 13, Fides reported that the final five had been released. Several children were reported to be among the abductees. Three Franciscan nuns who run a youth center and dispensary in the village were inside the St. Joseph Convent at the time of the kidnappings and escaped capture. The superiors of Jallouf’s Franciscan religous order said they suspect Al-Nusra Front elements were responsible for the kidnappings. Militants of the self-proclaimed “Islamic State of Iraq and Syria” had taken control of Knayeh village and the surrounding region last year, forcing churches to remove their crosses, banning the ringing of church bells and requiring women to veil their faces. Fides says 300 Christians remain in the small village and nearby area. But when the ISIS elements moved to the east at the end of 2013, Al-Nusra jihadists took over. Reportedly the group, which has seized control of both Christian and Muslim villages in the area, had recently seized Jallouf’s passport. Rev. Pierbattista Pizzaballa, major superior of the Franciscan group called Custody of the Holy Land, said the Knayeh Christians were being accused falsely of “collaborating” with the regime of Syrian President Bashar al-Assad. 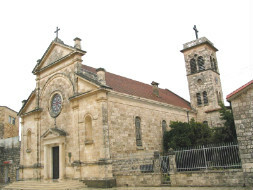 One source in Aleppo told news agency Agence France-Presse that the convent had been completely looted, and another report alleged the rebels had taken these church relics and documents to use as “evidence” against the Christians, to try them before an Islamic court. However, Pizzaballa could not confirm either of these claims. Fides reported Oct. 13 that Islamic authorities had confined Jallouf to Knayeh, and would try him on charges of collabortion with the Assad regime, though no trial date was specified. A Syrian activist contacted after the kidnapping told AFP that Al-Nusra had been trying to take control of some of the Franciscan properties in Knayeh, which had been resisted by Jallouf. The 62-year-old has lived in Knayeh for the past 12 years, one of 19 Franciscan workers currently serving in the country. A religious order of Catholics who still use the Latin rite, the Franciscans have ministered in Syria for the past eight centuries. In April, a Dutch Jesuit priest who refused to leave the embattled Syrian city of Homs, Frans van der Lugt, was killed by so-far unidentified assassins in his garden. Two weeks ago, a defector from IS in Raqaa told the BBC that an Italian Jesuit priest, Father Paolo Dall’Oglio (who went missing in July 2013 after visiting ISIS’ headquarters to try to hold talks) is still alive, but apparently a hostage. Two Bishops from Aleppo, Yohanna Ibrahim and Boulos Yazigi, were kidnapped in April 2013: there has been no word about them for some time.